Have you ever wondered where you would be if you traveled 100 miles in any direction? 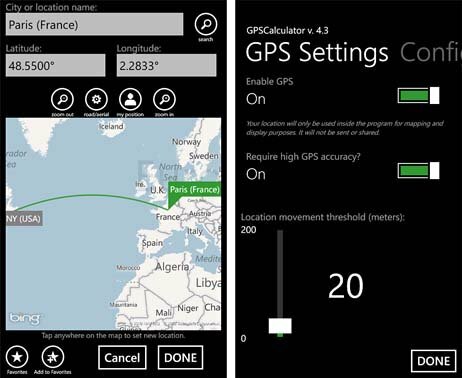 GPS Calculator is available over at the Windows Phone Marketplace that will tell you where you would end up. 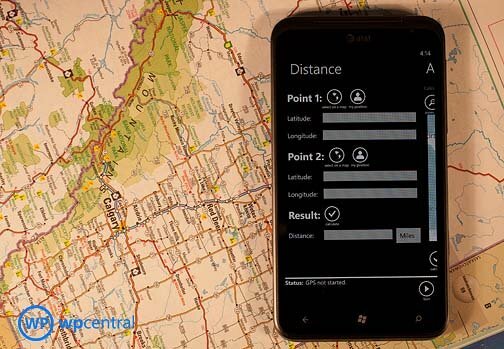 GPS Calculator is a tool box of sorts for your Windows Phone GPS that helps you determine distances, coordinates, and areas of maps. GPS Calculator's tools are laid out nicely in a straight forward manner. If you use your Windows Phone's GPS, GPS Calculator is a nice companion app to have. GPS Calculator spreads its tools across five pages that are set in a panoramic layout. The pages break down as follows. Project Page: The Project Page of GPS Calculator helps you determine where you would be if you traveled a certain distance on a certain bearing. The Source fields represent your starting point and you can choose a point on the map or use your current location. From there just enter your distance traveled and bearing, tap results and you are provided with the longitude/latitude of your final destination. Tap "show on a map" and you'll get a map view of your travels. Distance Page: As you would guess, this tool helps you determine the distance between two point. You can set the points by entering the latitude/longitude manually, find the point on a map or use your current location. Area Page: The Area Page allows you to calculate an approximate area of a non-self intersecting polygon on the map. Just tap out the points on the map of the area you are trying to calculate, hit the calculate check box and your results are returned in acres, hectares, or square metric or imperial units (feet, meters, miles, kilometers). Convert Page: The conversion page lets you enter GPS coordinates in decimal degrees or UTM manually, by tapping a point on the map or by your current location. GPS Calculator will then convert those coordinates into GPS coordinates. About Page: Here's where you can find all the information about the developer, other free apps from the developer and GPS Calculator's settings. Settings cover not only how the application performs (units of measurements) but also how the GPS performs. When you enter your location settings through the map view, you can do so by tapping a point on the map or search for the City/Location name. The map view has four button controls to zoom in/out, switch between road and aerial views and go to your current locations. When you find your location on the map, you can save it as a favorite for easy reference. The user interface with GPS Calculator is straightforward and simple. On each page you do have a start button to turn on your GPS. There isn't a help section but, again, the app is straightforward enough that you can figure things out fairly easy. Still, it would be nice to have some reference section for those (like me) still learning the ins and outs of GPS. All in all, GPS Calculator is a really nice application for your Windows Phone and supplements the native GPS rather nicely. I can see it coming in handy for hiking, geocaching or any other GPS related task. GPS Calculator is a free, ad-free application that you can grab here at the Windows Phone Marketplace.